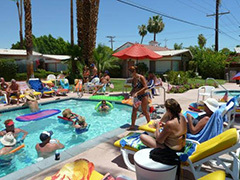 A Place in the Sun is a great place to hold your wedding, retreat, family reunion, or any other event where you can book all 18 rooms and bungalows at this unique property. Set on an acre of lush lawns and fragrant flowers, all units form a perimeter around the heated saltwater pool and spa, professional putting green, and poolside gazebo where guests gather, and meals can be served. This wedding was held at A Place in the Sun December 2017. Their video captured our hearts and even brought tears of joy to my eyes. We are so happy that this lovely couple graciously allowed us to share this on our website. 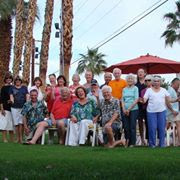 We’ve had many reunions, birthday celebrations, weddings and corporate retreats over the years. From quiet vows in a sunny garden area, to lavish birthday celebrations, A Place in the Sun naturally lends itself to groups that want to take all rooms at this unique property, to celebrate the way they want to celebrate. Please email, or call us at 760-325-0254 between 9 am and 5 pm daily, to see how easy it is to book your next event at A Place in the Sun. A Place in the Sun Garden Hotel 2017. All Rights Reserved.